A couple of days ago Marg and I put the kayak in the lake for the first time this year. It was a perfect morning—sunny and calm but not too hot. 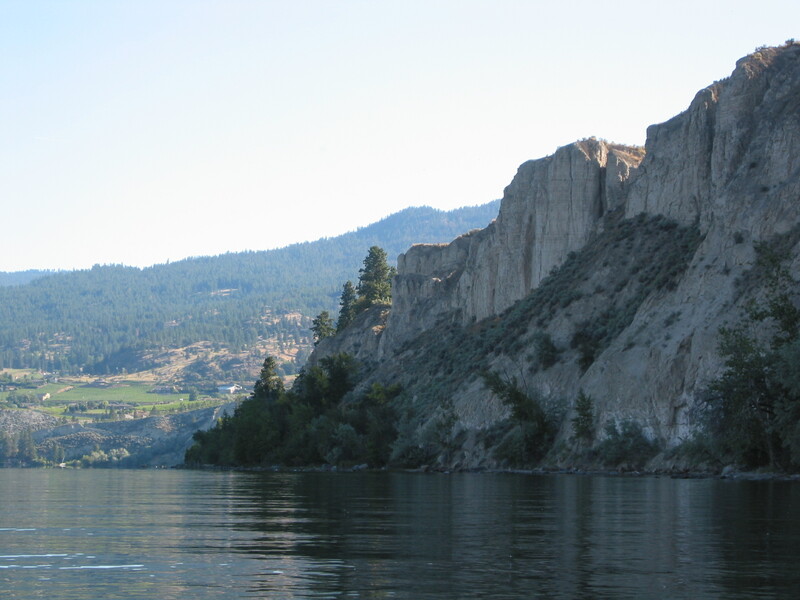 We put in on the southeast corner of Okanagan lake and paddled north along the steep shoreline. This is one of the few wild shorelines left on Okanagan Lake, although the wild part only extends up the steep slopes and cliffs to the orchards and vineyards on the benches above. On a lake with 2700 private docks and 1800 retaining walls built along its shoreline, it was inspiring to explore a section that was essentially the way it was centuries ago. After a short stretch of paddling away from the busy beaches of Penticton, we were gliding past groves of birches and cottonwoods above pocket-sized natural beaches. The only obvious feature of this shoreline that wouldn’t have been here hundreds of years before was the presence of Russian olive trees. These trees were introduced from Eurasia, and have become common on the silty soils above the lake. But, unlike a lot of invasive plant species, Russian olives have a positive side–they produce many small whitish berries that are a favourite winter food of Western Bluebirds. Birds were conspicuous all along the shore. Family groups of Mallards and Canada Geese, the young by now almost adult-sized, foraged in the shallow water. Offshore, a pair of Common Loons drifted by, disappearing underwater at intervals to look for a fish breakfast. Might these birds nest along wild stretches of this shore? 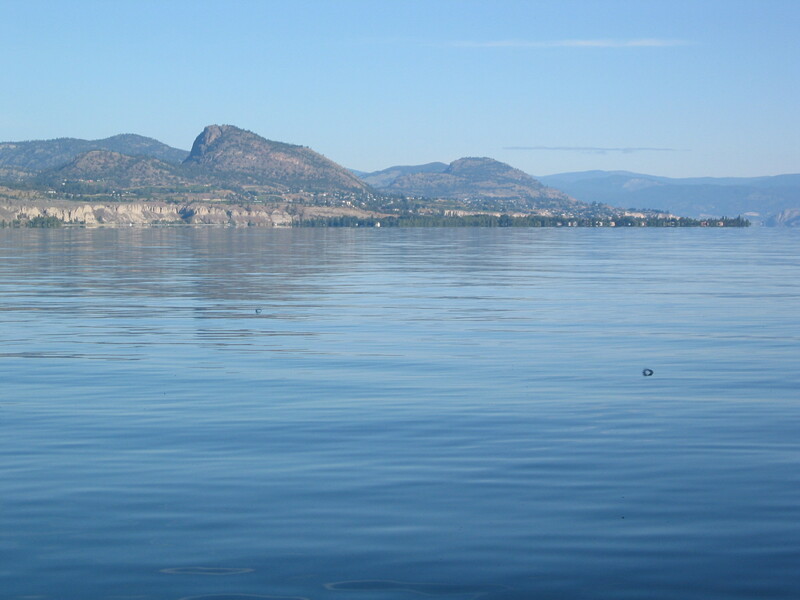 I’ve never heard of a loon nest being found on Okanagan Lake, but there are always loons on the lake through the summer. At one point a huge Bald Eagle sailed in at cliff-top level and landed on a prominent point to survey the waters below. Eagles feed primarily on birds around here, so maybe the ducks were its target—they are rather vulnerable in midsummer during their flightless moult period. On land, fledgling Bullock’s Orioles chattered from the trees and the flame-orange adult males flashed between shrubs searching for caterpillars to feed them. A flock of Bank Swallows wheeled noisily around their colony built into the silt bluffs. These silt bluffs were formed at the close of the Pleistocene. The Okanagan Valley was filled with a huge glacier flowing south from the Monashee Mountains. About 12,000 years ago the climate warmed and the glacier came to a stop and began to melt in place. Lakes formed along either side of the glacier, filled with silty meltwaters flowing in from the mountains to the east and west. The silt settled to the bottom of the lakes to form deep sediments. When the glacier disappeared entirely, the silt deposits were left behind as benches on either side of the lake that filled the valley. For centuries the benches were covered in dry grasslands, forming a rich dark brown soil that now supports the vineyards and orchards around the south end of the lake. And the steep walls of the silt bluffs have kept this shoreline wild.